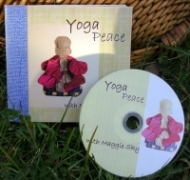 YogaPeace by Maggie Sky, certified Kripalu Yoga teacher, is an audio CD designed so that you can choose your own length and style of practice. This CD is designed for continuing yoga students, and includes traditional postures such as the Warriors, Down Dog, Child's Pose, etc. Choose a 20-minute short yoga routine, a 40-minute longer yoga practice (with meditative drumming in the background), or a 10-minute guided relaxation. Combine tracks for both yoga and relaxation.